On September 29th, the omnibus movie 'BUNGO ~Sasayaka na Yokubo~' held a stage greeting on its opening day. 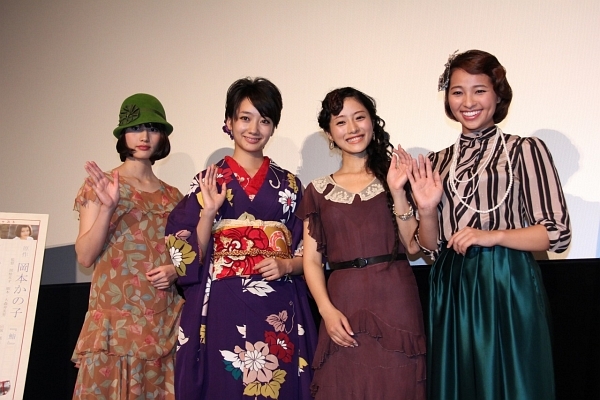 The greeting was attended by the four actresses Ishihara Satomi, Hashimoto Ai, Haru, and Misaki Ayame and since the movie features several short love stories set during the Show era, they all impressed the audience with a fabulous retro look. 'BUNGO ~Sasayaka na Yokubo~' is made up of a total of six stories divided into the two main themes 'Mitsumerareru Shukujotachi' (lit. 'Eye-Catching Ladies') and 'Kokuhaku Suru Shinshitachi' (lit. 'Confessing Gentlemen'). The stories are all based on short novels by some of Japan's finest authors from the Showa era. More details can be found in the previous article. Actress Ishihara is co-starring together with comedian Miyasako Hiroyuki (Ameagari Kesshitai) in a spicy love story titled 'Chumon no Ooi Ryouriten'. In one scene of their story, Miyasako is giving Ishihara an oil foot massage. Ishihara commented, "Miyasako actually disliked the slippery feeling with the oil, so he wiped off the oil on his hands with my feet after the filming." She continued, "He was a bit embarrassed, because he didn't know whether it was really okay for him to keep on touching my feet although the filming was over. I liked it, because it helps with your blood circulation. Moreover I've always wanted to work with Miyasako, so I was really glad for this opportunity." Hashimoto is playing a girl who is falling in love with a middle-aged man, played by Lily Franky, in the story titled 'Sushi'. She bashfully commented, "He's such a lovely person and he made me completely fall in love with him for real." Moreover she revealed that she wouldn't mind dating an older guy as long as the person has a good personality. In 'Koufuku no Kanata', Haru is portraying a married couple together with actor Miura Takahiro. She said, "It was my first time playing someone's wife. Fortunately it was supposed to be an inexperienced new wife, which made it easier for me to play it convincingly." Misaki is helping a boy through his puberty in the story titled 'Chibusa'. She expressed, "I was raised as one of five sisters, so it was a bit difficult for me to approach him during the breaks." The movie's titles '~Sasayaka na Yokubo~' literally means 'modest desires' and therefore the cast was asked to reveal their own modest desires. Ishihara replied, "I want a machine that can make cream smoothies. I also would love to go abroad, now that the Yen is so strong, so I can buy the machine cheaper." Hashimoto immediately replied, "I want to wear a school uniform." She explained, "I'm going to a school where it's allowed to wear your own clothes as well, so I didn't get a uniform. In movies I'm often wearing school uniforms, but I also want to wear it in private when commuting to school and even just when walking around the streets." An earnest wish from an active senior high school student. BIGMAMA reveals PV for "Fukan Show"